How I Lost 18 Pounds in Just 14 Days! Note: This is a guest post from Brad Chaffee of Enemy of Fat. Are you looking to shed some extra pounds around your midsection? Summer is almost here and if you’re anything like me, heading to the beach in a swimsuit is out of the question unless you are fit and in shape. Sadly for me, in the last 10 years I have missed out on truly enjoying the summer months because of my bulging waistline. This summer, however, is going to be much different! Earlier this year, I declared 2011 to be the year of weight loss and I planned to stick to it this time. I’ve lost 38 pounds since February, and yes, you read the title right; I lost 18 pounds in the last 14 days! Now normally if I was to see a headline like that I would automatically assume the article was pushing a magic weight loss pill, or some new “gimmicky” workout machine. If you’re here looking for either of those two things, you’re reading the wrong article. What I did wasn’t magical, nor did it take 8 “easy payments” of $19.99. What I did took hard work and discipline and was based on a solid exercise regiment and proper nutrition. I am doing a Beachbody home workout program called Rev Abs. It is one of the many home workouts they offer, among one of the most popular workouts – the “one and only” P90X. Some of my weight loss can be attributed to P90X, but since I am nursing a “frozen shoulder” I was told I could no longer do upper body strength training. This led me to give Rev Abs a try, and even though P90X has my heart, I am really glad I stumbled across it. “Rev Abs is a brand-new ab system specifically designed to burn off the fat and give you a six-pack in just 90 days. Trainer Brett Hoebel teaches you to work your abs from six different angles, and to engage your abdominal muscles throughout your entire workout. Rev Abs comes with an easy-to-follow nutrition guide that helps take the guess work out of your meal plan. The first 14 days you have the option to do what Brett calls the 14-day jump start plan. This plan is designed to shed the fat by forcing your body to burn fat for fuel. I have tried many “quick start” programs but have been really pleased with this one more than any other. The provided recipes are super easy and quick to fix. I picked the ones that I liked the most and developed my very own 14 day meal plan. To summarize, I simply followed the 14-day nutrition guide to the letter, and completed the workout DVD’s according to the workout schedule provided. The workouts are fun and easy to follow and unlike P90X, the workouts aren’t quite as long if you’re short on time! It combines a variety of exercises including some strength training, with a focus on abs and back, and interval workouts to help you sculpt your midsection and burn those calories. Another thing I like is something called the Rev Zone, where you have the option to push yourself even harder for that extra benefit. Obviously, I would recommend this workout program to anyone looking to eliminate those pounds and strengthen their abs. 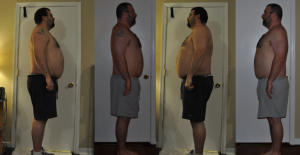 I am amazed at the results I saw during the 14 day jump start. I worked hard, stuck to the nutrition plan, and in the end I saw the results the program promises. If for some reason you don’t see the results you want in the first 30 days, Beachbody offers a 30 day 100% money back guarantee – no questions asked. If I can do it, so can you! I used to say I didn’t have time. I used to list off excuse after excuse while wondering why I just couldn’t lose the weight I wanted to lose. The secret isn’t in the program you choose as much as it is in the attitude you decide to have while doing it. It all boils down to your priorities and how you can take something as important as your health, and make it happen. I stopped with the excuses and decided to take this journey seriously. Once you do that, something like Rev Abs, Thrive 90 Fitness, and even P90X, can become an important tool in your health and fitness tool box. No matter what program you choose, I hope you’ll join me! Note from Tony: If you’re ready to make your own fitness transformation and you need some help choosing the right fitness program for your goals, you’re welcome to contact us and we’ll point you in the right direction. Brad Chaffee is the author of Enemy of Fat, where he documents his weight loss journey with the hope of inspiring and motivating others to join him. His life-long addiction to food caught up with him in his adult life and after 10 years of being obese, he has decided to make health and fitness a way of life. You can follow his journey by subscribing to Enemy of Fat to receive weekly updates.